Pre-Application Conference to discuss a Type III Historic Resource Review for a new 4-story, mixed-use creative office building addition to the New Market Theater Historic Building. The New Market Theatre is a designated Historic Landmark, within the Skidmore/Old Town Historic District. The applicant has submitted 3 different possible fascades that illustrate the design options being considered. New mixed use building, six story with retail and residential units at ground levels and residential units on the upper floors. New mixed use building – ground floor to be retail with apartments above. Next Portland is taking a break over Christmas. Blogging will be light in the coming week, but will resume at the normal frequency the following week. The building that used to house Starky’s Restaurant and Bar has been demolished, reports The Portland Chronicle. A permit is currently under review for a 46 unit, 3 story apartment building on the site at 2913 SE Stark St.
An article in GoLocalPDX asked “will growth kill the Pearl?” Quoted in the article was a representative of Preserve the Pearl, the organization that has now appealed the approval of Block 136 to the Oregon Court of Appeals. The City Council voted 4-1 to dedicate revenue raised from short term rentals including Airbnb towards affordable housing. In a record setting deal, Singaporean investors paid $45 million for the Janey II apartment building, which will in the future become a “temporary home for visiting employees at Portland-area companies.” The deal includes both the first phase building, completed in 2012, and the recently completed Janey II addition. The Portland Mercury reported that the State Legislature may take up inclusionary zoning again during the 2016 session. A bill that would have lifted the current ban on local governments from mandating that developments include affordable housing failed during the 2015 session. 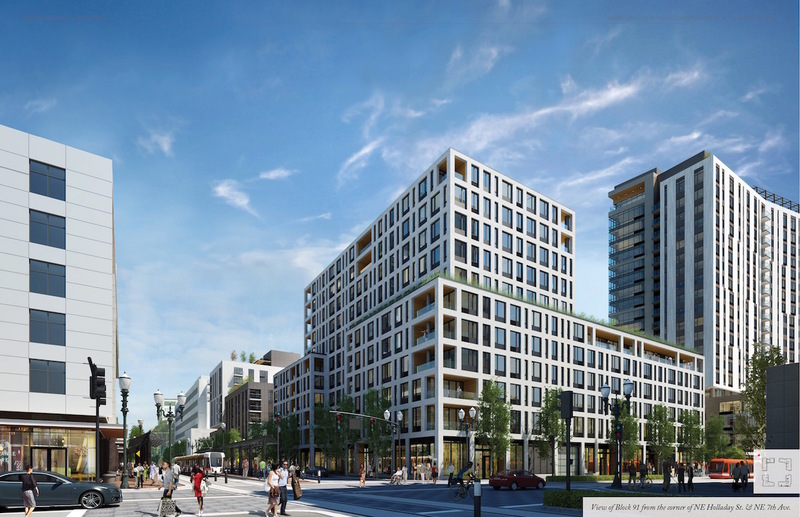 After 4 Design Advice hearings, the proposed 15-story mixed-use development at 4th & Harrison has gone before the Design Commission for its first Design Review hearing. The 175’ tall building will provide 424 residential units, with a mix of studio, one, two and three bedroom apartments. At the ground level a 33,000 sq ft supermarket is planned, as well as an additional 5,000 sq ft retail space. 151 vehicular parking spaces are proposed, split between 80 spaces for the residents, and 71 for the supermarket / retail uses. An optional 3rd parking level would provide an additional 81 spaces. The project is being developed by Chicago based developer Core Spaces. The design architects for the building are Hartshorne Plunkard Architecture of Chicago, with Portland based Myhre Group Architects acting as consulting architects. Portland based Lango Hansen are acting as the landscape architects. 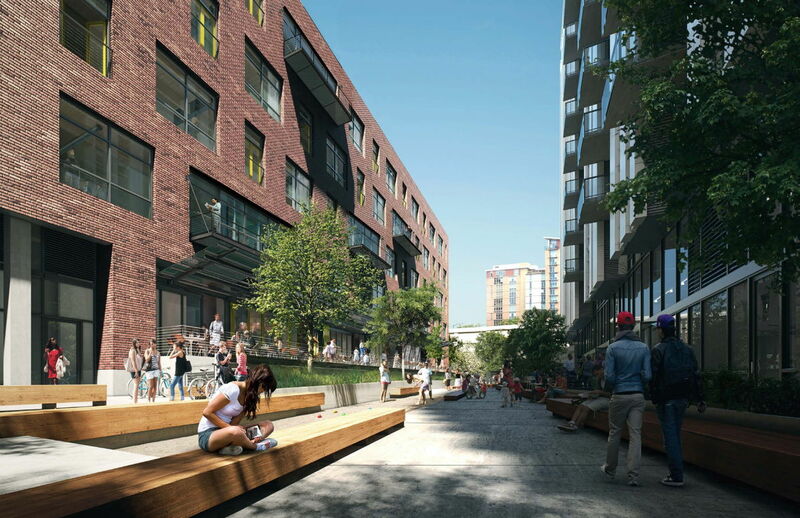 An article in The Oregonian noted that South Waterfront “is booming again”. 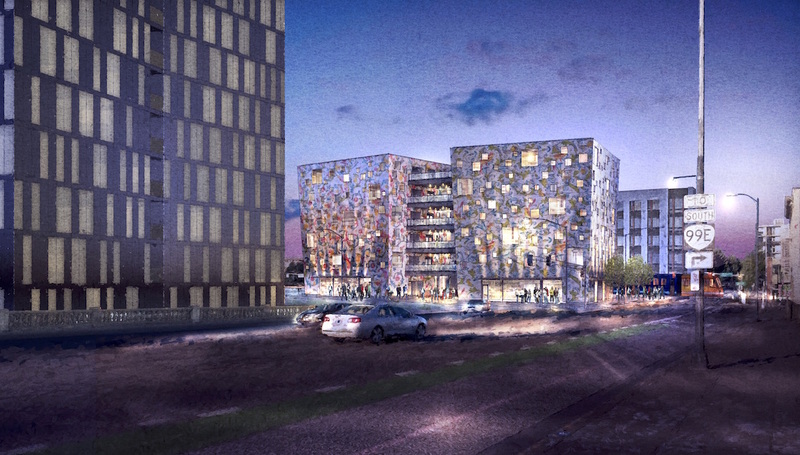 Projects mentioned include Zidell Blocks 4 and 6, Riverplace Parcel 3, OHSU Center for Health and Healing South and the OHSU Knight Cancer Research Building. The Portland Mercury reported that the City Council will vote this week on an ordinance that will direct money raised from short term rentals such as Airbnb into the Housing Investment Fund. The measure would allocate $1.2 million of new money for affordable housing every year. Cascadia Behavioral Healthcare is planning a new integrated health clinic and low-income apartment complex, writes OPB. The Garlington Center at 3034 NE MLK Jr Blvd will replace an existing building on the site owned by the non-profit. 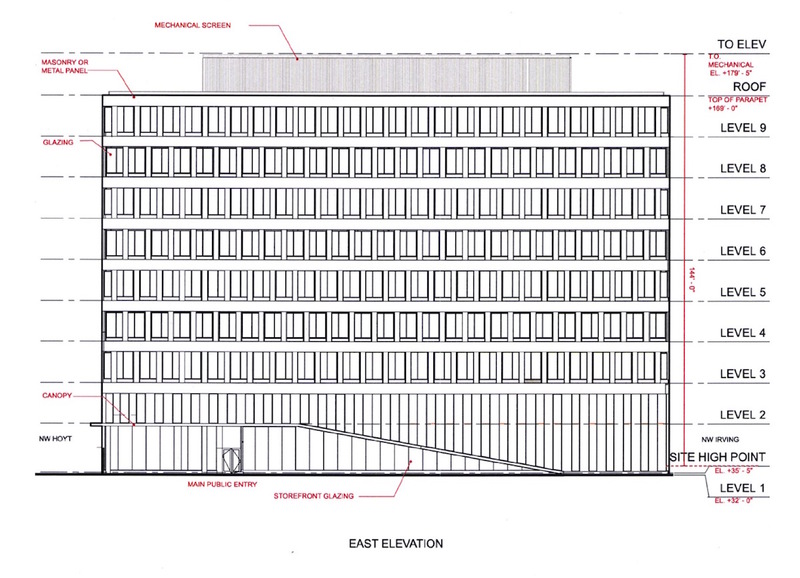 Plans are moving ahead for the new Multnomah County Courthouse, according to The Oregonian. The County is now planning on including the District Attorney’s office and high volume courts in the building, which is likely to raise the cost of the project by $40-50 million. An article in The New York Times by local writer Brian Libby looked at the three building One North development on N Williams by Holst Architecture and PATH Architecture. The Karuna East office building was recently completed, and is leased to digital creative agency Instrument. Digital product agency Uncorked Studios has leased the entire third floor of the 811 Stark building, according to the Portland Business Journal. 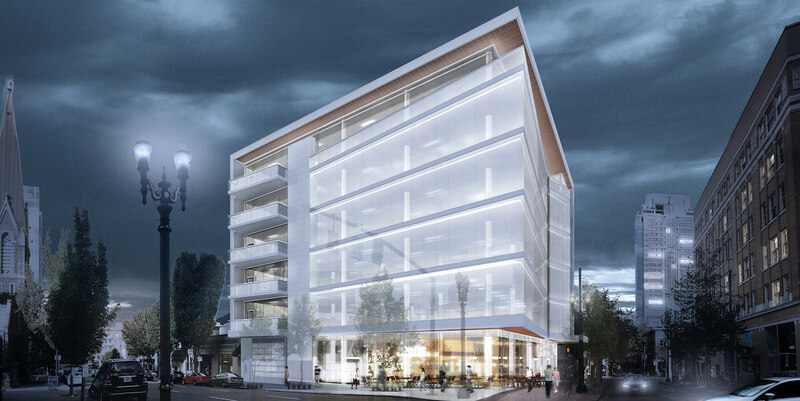 The Central Eastside building by Works Partnership is currently under construction. 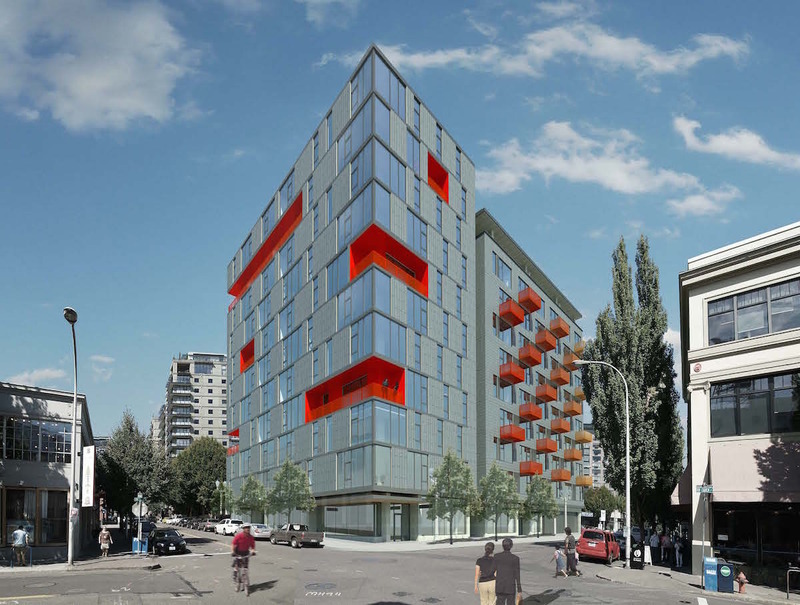 The City Council approved 10 year tax exemptions for three buildings that will collectively include 81 units of affordable housing, wrote the Portland Business Journal. The buildings are the North Hollow Apartments at 1501 SW Taylor St, the Vancouver Ave Apartments at the NE and SE corners of the N Vancouver Ave and N Shaver St, and the Mississippi Apartments on N Fremont St between N Mississippi and N Albina Ave and on N Cook Street between N Albina and N Borthwick Ave. The Willamette Week wrote about a potential conflict of interest identified by the City Auditor, due to the fact that members of the West Quadrant Plan Stakeholder Advisory Committee are landowners in the area. The Auditor’s report said that individuals such as Greg Goodman of the Downtown Development Group should have disclosed their financial interests before casting any votes, including ones that increased the allowable heights at the Morrison and Hawthorne Bridgeheads. The Oregonian wrote that Portland’s 3.6% apartment vacancy rate was the lowest in the nation in 2014. This post is the second in a series on Oregon Square, focusing on Block 91. See also Part I about the urban design and landscaping, Part III about Block 102, Part IV about Block 90 and Part V about Block 103. 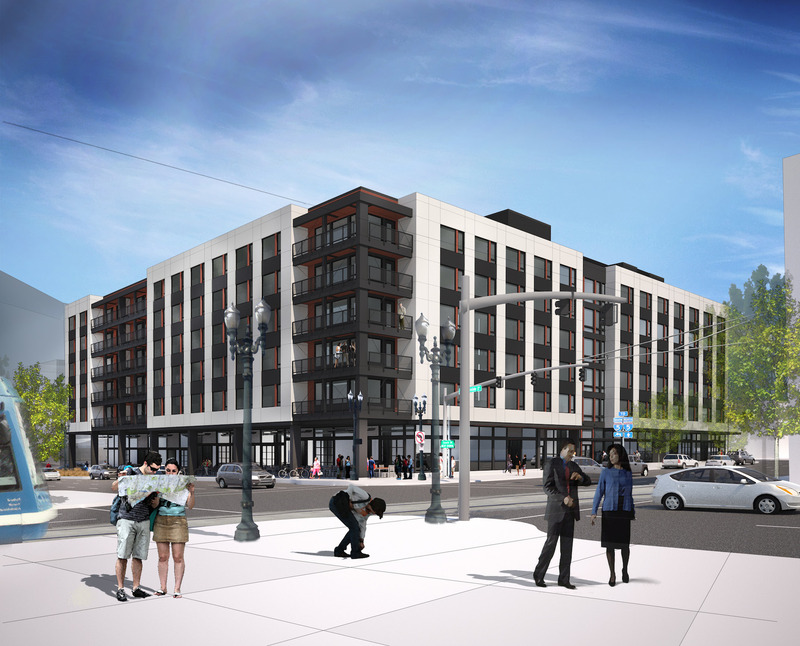 With 160 units, Block 91 will be the smallest of the four buildings at Oregon Square, the giant Lloyd District development planned by American Assets Trust. 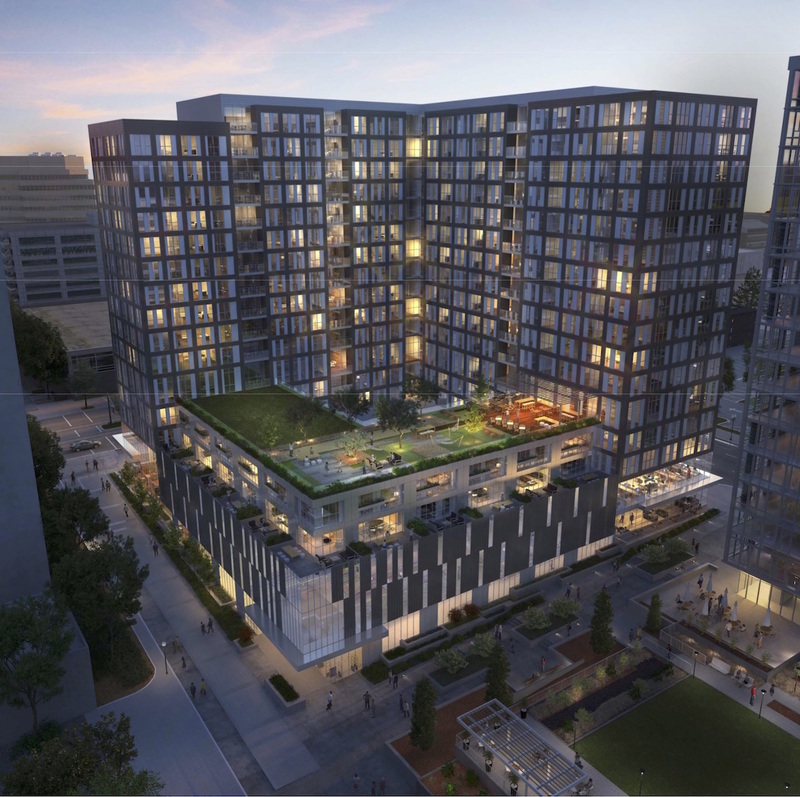 The building by GBD Architects will rise to 132′-6″ over its 11 floors. 14,181 sq ft of double sided ground floor retail will open onto both the new square and the surrounding streets. Amenities for the residents, located on the 6th and 7th floors, will include a yoga room, a fitness room, a private dining room, a community room and a dog lounge.